The climb up to the University campus once again proves a good morning wake-up exercise en route to the 8am Viola Orchestra rehearsal. But, in an excellent example of Murphyism, when the tough get going (that would be me), the going also gets tougher. For example the University had run out of spare violas overnight, so the rehearsal was mostly spent in “air viola” mode for my part. Maybe a good thing, because the extra repertoire that landed on our stand was definitely more challenging than yesterday’s rather innocent, if at times looney tunes. The Australia and New Zealand Viola Society (ANZVS) Viola Composition Contest Workshop was about to start next door. We’d like to do something like this in Rotterdam next year, so I was curious about their set-up. Composers had been invited to write for viola solo or ensemble, with a duration limit of 5 minutes. The composers had been requested to use pseudonyms so as to avoid jury bias. The results of the contest were presented by Greg Mcgarity and Olwyn Green. Roughly half of the 22 submitted works were for solo viola, the others for ensembles of 2 up to 8 violas. 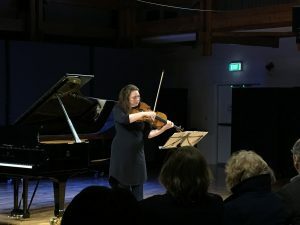 A number of the best works were performed live by an ad-hoc ensemble, and the audience was invited to submit feedback. The piece “Two Emotions” for 8 violas was performed first. The pure viola quintet “Are we there yet” has an ostinato in the lower voices and strong leads on top. A very appealing piece. “Alto Gether” for viola septet is a ‘Rondo Allegretto Scherzando’ in a rather conventional melodic concept. 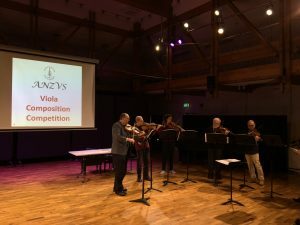 In contrast, “Once Bitten Never Shy” for viola quartet exposes a multitude of ideas and techniques, without really straying far from tonality. But perhaps a bit too many ideas competing for attention within a short time span. “Danza per Tre” (for 3 violas, obviously) starts in an introspective bluesy mood, but then transitions into a more upbeat jazzy chorus, complete with half-step modulation etc. With a little more rehearsal time it could be fun to play. The composer himself, though not a pro player, plays the lead part. With respect to the notation, a comment from the audience led to a discussion about the “cut and paste” trend in composition where software transposes freely but often without regard to the readability for the musicians. At this point I decided to walk down to the Te Papa museum to learn something about New Zealand (non-viola topics, that is). It didn’t take long before the viola mob overtook me, however; a viola was thrust into my arms and I became complicit to a Pachelbel flash mob right there in the museum. It can’t be denied: The violas rule in Wellington this week! 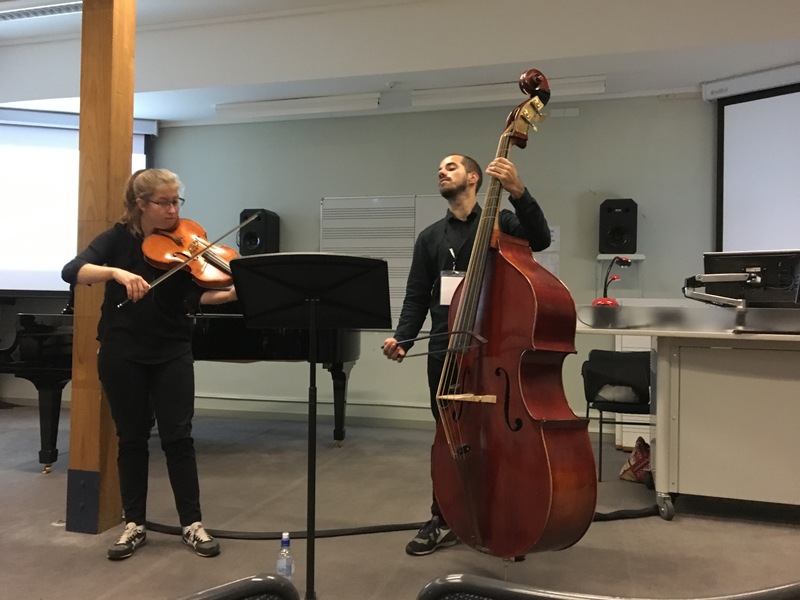 The afternoon took on distinctly Dutch colours: first Luca Altdorfer, a Hungarian student from Groningen, gave her lecture-recital about the music of Karl Friedrich Abel, together with her Italian double-bass companion Severiano Paoli. They have arranged Abel’s duets for viola da gamba into viola plus Viennese bass, the latter of which is a fretted 5-string bass with harmonic tuning. Unfortunately this instrument was damaged in transport (bloody airlines! ), but it was still playable. Luca in turn had been denied boarding with her viola, so she had to leave it at home. Fortunately she was able to borrow a beautiful baroque styled viola from one of the exhibiting luthiers at the congress. They performed several of their arrangements, explaining also the process and the reasoning behind some specific transcription choices. The lecture was well received. Immediately following this was a “Viola Potpourri” session, where several shorter musical contributions are combined in a single programme. Christopher Luther (USA) played some well-known repertoire by Gluck and Stravinsky, as well as his own transcription of Thelonius Monk’s”Well You Needn’t” for solo viola. Elisabeth Smalt from Amsterdam (NL!) took the stage. She first played “Music for viola” by Yannis Kyriakides. The apparent genericity of the title encodes the fact that the subject matter is word “Music” itself, expressed in 100 different languages. The result was a long string of carefully pronounced “words” which required great concentration from both the performer and her audience. Extensive use of harmonics and even humming of certain harmonically significant notes. She went on to play “For Bob” by Kevin Volans, accompanied by her brother Christian Smalt on the piano. Again modernist style, interesting and performed with great pose and conviction. The New Zealand native Alexa Thomson, who currently studies at Rice University in Houston, made an appearance with the solo sonata of NZ composer Anthony Watson. The rather terrifying 2nd movement is somewhat like Hindemith’s infamous “Tonschönheid ist Nebensache”, but then smeared out in alternating double-stops over 4 strings. It is reportedly a “cornerstone” in NZ viola repertoire. Whow. To soothen our ears, the Potpourri ends with the “Zwei Gesange” op.91 van Brahms. Enter today’s performing Dutch(wo)man number 3, the singer Maaike Christie-Beekman, who moved to NZ only 7 years ago. The Brahms is well sung, also by the violist. 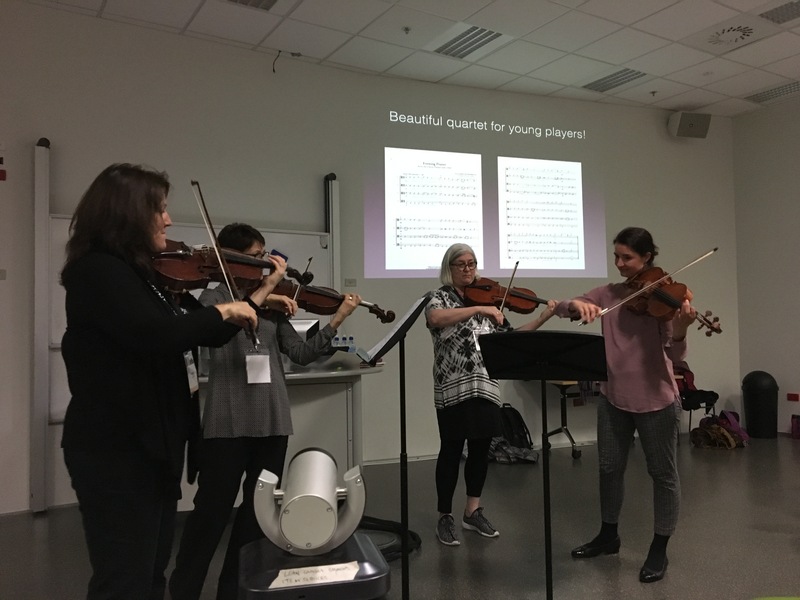 The last lecture I attended today was “Building Performance Skills Through Viola Ensembles”, by Martha Carapetyan and Ames Asbell, both viola professor/teachers from Texas, USA. It is a well structured presentation of how viola ensemble repertoire can be used in a progressive teaching context, from beginners to advanced students. Extra bonus points for plugging our presentation on Tuesday morning! I am now in my hotel room finishing this blogpost, and will then spend the evening working on my presentations for Monday and Tuesday. That unfortunately means skipping the evening concert with works by Dvorak and Janacek. And so today’s blog ends here.